SWEDISH TABLOID AFTONBLADET REJECTS STORY OF ORGAN HARVESTING FROM PALESTINIANS IN AMMAN JORDAN……. – The Tundra Tabloids……. SWEDISH TABLOID AFTONBLADET REJECTS STORY OF ORGAN HARVESTING FROM PALESTINIANS IN AMMAN JORDAN……. 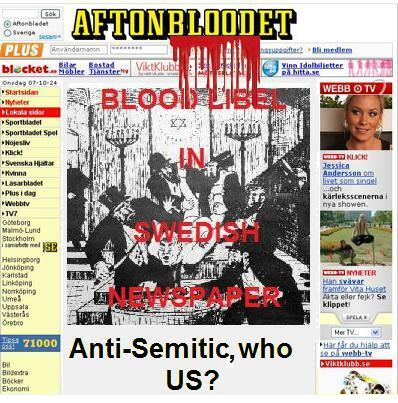 Aftonbladet: Organ trade outside of Israel? No thanks! Editor Jan Helin of Swedish Aftonbladet was only too happy to publish Donald Boström’s science fiction story about Israeli soldiers killing Palestinians in order to steal their organs. The same editor completely disregards real-life stories about organ trade involving destitute Palestinians selling their organs at flesh-markets in Jordan and Egypt. Why is this, one might wonder. We’re wondering if you’ll be covering this story — which is a current one, verifiable and not from 1992 as Donald Bostrom’s was – about organ abuses. We assume, on the basis of Aftonbladet’s August 17 story that the paper has a particular interest in organ trafficking issues, as well as the concerns of Palestinians in this regard. We look forward to your informing your readers about the trafficking reported here and the reference to Egypt, India and Pakistan as venues for harvesting organs from various vulnerable peoples. As previously requested, we continue to urge response to our letter of September 11, 2009 and corrections of errors in the August 17 Aftonbladet feature story. Previous Post Previous Post YULETIDE GREETINGS FROM THE FORMER SHEIK AND NEWLY CONVERTED TO CHRISTIANITY… YOUSUF AL-QARADHAWI……. Next Post Next Post THE NORWEGIAN GOVERNMENT TAKES A DIRECT HAND IN SUPPORTING AND PROMOTING THE PRO-HAMAS BOOK ‘EYES IN GAZA’ INTO A BEST SELLER IN NORWAY…….